There is something very charming about Châteaubriand. I love serving this dish when entertaining at home! It is probably among the most flavoursome and tender meat concoctions, especially when done right. Personally, I prefer meats blue (a step below rare). Honestly, a proper meat cut needs no more than, good olive oil, black pepper, salt and a good searing all over. That is it, and just allow the meat to speak its own volumes about its goodness. This is the thing about good produce, really you need not do much with it. However, if you prefer meats a notch more cooked, then go for rare, or even medium, but do not kill it with overcooking! Especially with a Châteaubriand, you lose the goodness of this cut and this awesome dish with an overcooked meat. It is a crime! Châteaubriand is a recipe utilising a particular cut from the beef tenderloin (watch the video to learn how to prepare your ownChâteaubriand cut). Connoisseurs insist that the term refers to the quality of the beef bred around the Châteaubriant town in the Loire-Atlantique, France. They might even suggest that unless that specific meat is used, the dish cannot be classified as authentic Châteaubriand! 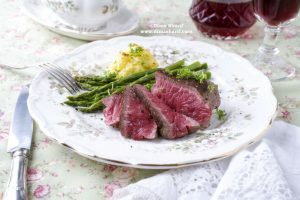 However, the tenderloin from other breeds have been used in the making of this dish, and some critics argue that as long as the right cut from the right part of the tenderloin is used, the dish is by all means a Châteaubriand. 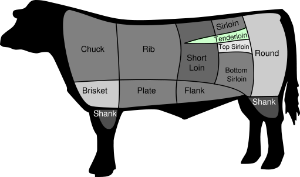 Therefore this cut of meat has become known as the Châteaubriand cut. Despite the technicalities of the meat cut, the story of this recipe goes way before the classification. It’s been known that this recipe was developed by personal Chef Montmirail, for the French author François-René de Chateaubriand. François-René was The Secretary of State for two years for Louis XVIII as well as a diplomat serving Napoleon. Because the recipe was developed for such high ranking personality, as well as its use of a more expensive meat cut, it has always been associated with luxury dining. Châteaubriand is classically served with a reduction of white wine and shallots, softened with demi-glace, then mixed with butter, herbs and lemon juice. Nowadays, it is traditionally served with – and best complimented by – a Béarnaise sauce. Also traditionally, some boiled vegetables are slightly cooked with the remaining butter from cooking the Châteaubriand, and then all are served surrounding the meat, sprinkled with finely chopped herbs. This is a Classic French Recipe that is exceptionally good and always impressive to serve. And since we are going for less-traditional Festive Dinners this season, I thought I must include this marvelous dish to the repertoire of recipes on this website for you to try. Festive or any other occasion, you will love serving this beautiful dish of exquisite meat surrounded by assorted accompanying vegetables complimented by the delicious Béarnaise sauce. If you have access to a gourmet independent butcher, then all you have to do is ask for a Châteaubriand. They will know what you are talking about, and will give you exactly that. If you don’t and your Butcher is clueless, ask for the thick part of the Beef Tenderloin, otherwise watch the video and prepare your own cut. Go for the best quality meat available, because at the end of the day, the meat is the star of this dish. I have gone for roasted vegetables as a side. Roast the vegetables separately, simply sprinkle with salt, black pepper and drizzle olive oil all over them. Add 2 tbsp DS Pickled Zaatar and rub all over. Roast in a preheated oven (450 F) until slightly browned and cooked through, making sure to turn throughout. Start by roasting your vegetables, dress them with DS Pickled Zaatar and place them in the roasting tin and roast, uncovered, until cooked through (making sure to turn them throughout the roasting). Meanwhile make the Béarnaise sauce. Boil some water in the bottom part of your double boiler (making sure the water won’t touch the top part of the double boiler). In the meantime, in a small saucepan, mix together the vinegar, chopped shallot, the spring of thyme, the bay leave, salt and black pepper and bring to a boil. Reduce the heat and simmer to reduce by half. Strain the vinegar mixture into the top part of your double boiler and discard the shallot and herbs. In a separate bowl, whisk together the egg yolks. In a thin steady stream, while continuously whisking, pour the egg yolks into the vinegar until combined. Set the pot over the steaming simmering water and continue to whisk. Add the butter a cube at a time, whisking until fully incorporated before adding the next cube. Continue until all butter had been added. The mixture should be smooth, with no lumps and emulsified (not separated). Remove from heat and stir in the tarragon and parsley. Cover the top of the sauce with cling film, to prevent formation of skin, and keep in warm bain marie to keep warm. Do not reheat the sauce once cooled. Rub the Tenderloin lightly with olive oil, salt & Black pepper to cover all. Place the butter and olive oil in a large ovenproof pan over high heat. Once the butter sizzles, add the meat and sear on all sides until the outside is browned and completely sealed. Top the seared meat with the cherry tomato vines and place in a 450 F oven for 10 minutes for rare and 15-20 minutes for medium. Remove the pan from the oven, and rest the Châteaubriand for 10 minutes on a wire rack, covered with foil. In the meantime, Arrange your vegetables on a serving plate and sprinkle with thyme leaves and chopped chives. Place the Châteaubriand on a wooden chopping board or slice it and arrange it on a serving plate. Serve with the Béarnaise sauce in a sauce boat on the side. Despite being known as a technical dish, Châteaubriand is not that hard to make. There is always a chance that the sauce may split, but if you follow the instructions precisely, I guarantee you, it will work like a charm. This is one of my favourite recipes, and one that everybody loves. Give it a try and serve it to your family and friends, and see how they are going to love you for it. They will even be looking forward to the next time you make it, which I know will be not too long after! It is that good. Hope you have enjoyed this post, and that you too will become a fan of the delicious Châteaubriand. Do let me hear from you, I love nothing more. Come back again soon for more not so traditional festive menu options that will tickle your taste buds.